Every time I come here I feel very moved by the environment—it’s always so peaceful. Even though I’ve been here in the past I always find such a calming and peaceful environment. Also to see all the joyful faces of the community here. It’s full of Dharma joy, and I am very moved by that. I am also moved by how hard Ven. Chodron has worked to establish an abbey and a sangha community here and how hard everyone is working to make the Dharma take root here. These are things that make me feel very touched whenever I come to the Abbey. And so, no matter how far away I am, I will return again and again. We are like a big family. We don’t have to say a lot of nice and polite things. If we see our surroundings as a pure land and see the food as pure nutrition so that everything we eat will be very pure, and see all the fellow practitioners around us in a pure land, then our mind will be very happy. However, if our mind sees everything as impure – the mind that picks faults – then we know our practice is not going in the right direction. It’s very important to come back to the Dharma to remind ourselves to keep our minds in a pure view of what’s around us. All these are principles that we know already. They seem simple, but the moment we meet difficulties it’s hard to keep our mind on the path. But with the teachings of Ven. Chodron and the efforts of the community, it’s possible for all of us to do our best to practice and keep our minds in the pure land and to have a happy mind. So everyone let’s now enjoy this beautiful pure food – both the food on the table and the food of the Dharma. I have said that Sravasti Abbey is the Pure Land on Earth, but just having an Abbey, a monastery, alone is not enough. The external environment is just one factor. Actually there is another factor: The Dharma—having a monastery that has the Dharma. Where there are practitioners practicing the Dharma and practitioners teaching the Dharma—that place, that Abbey—is the one that contains the Dharma. This is my first time to visit Sravasti Abbey, and I notice the Abbey not only has the external conducive facilities; it also has the internal quality—in essence, the Dharma. By studying here you have a very good advantage. My teacher used to say to me if you want to search for a monastery, there are so many beautiful places on earth where you can go and stay and enjoy the beauty, but the kind of person who would choose those beautiful places is not the wise person. You should stay in the place where people are practicing the Dharma, turning the Dharma wheel, and also walking on the path of the Dharma. If you choose to stay in those kinds of places, that is the right place. I met Thubten Chodron many, many years back, and we joined the sangha in the same year, although in different countries. We are nearly the same age. This is my first time to the Abbey, and here’s one thing that struck me, astonished me. I was considering maybe retiring, but when I saw Thubten Chodron having all this huge land and helping and teaching people, I was so moved. I thought to myself, “I remember what my teacher told me, ‘A good place is a place where they’ll have Dharma.’” And this bodhisattva mahāsattva is here at Sravasti Abbey, turning the Dharma wheel. The Dharma contains śila [ethical discipline], concentration of the mind, and wisdom. I observe that you have a very tight schedule at the Abbey. You remain in silence every day, and everybody is so harmonious. That is an indication that you have a very good foundation of śila. Also I can see from your peacefulness that your mind is constantly in the Dharma. I also notice that Thubten Chodron is constantly teaching you the Dharma. Before meals she will give you a teaching, and during the meal, and even at the meal. 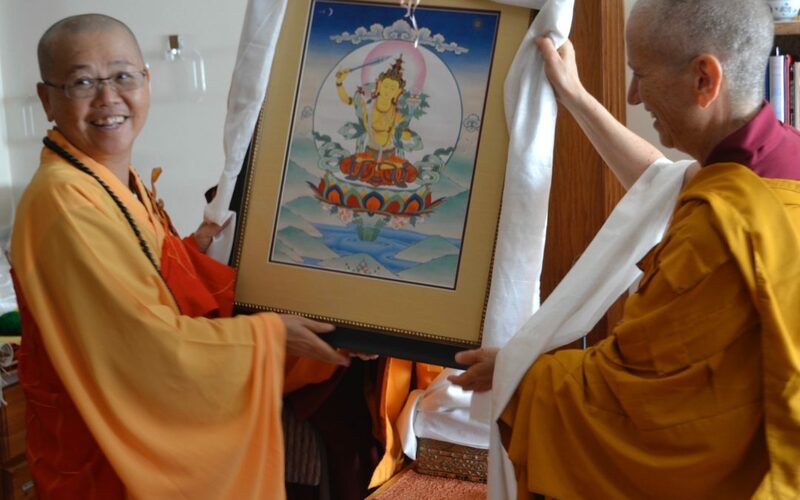 She is constantly turning the wheel of the Dharma, and so here is a wonderful place. It is rare and it is also precious to have this kind of monastery around. And you can come today. That is really a sign, an indication, that you have strong merit, a strong karmic connection. Please continue to cultivate your merit and your wisdom, and I hope everybody one day can become Thubten Chodron. Learn more about Venerable Mingjia Shih.